For a lot of us, the summer is a perfect excuse to laze around under the warm sun for hours. It's a great time to temporarily forget about work as well as your other adult responsibilities and revert back to the carefree personality you had as a teen. Whether you plan spending your break on a secluded beach somewhere in Cancun, or on a nearby resort just a few minutes away, summer vacations can be quite tricky. Taking a break from your established daily routine can take a toll on your health and your mood if not done mindfully. The heat, while welcome, can also derail your plans. The important thing to remember when making your summer itinerary is to make sure that you do not pack too much activities in that little free time you have. 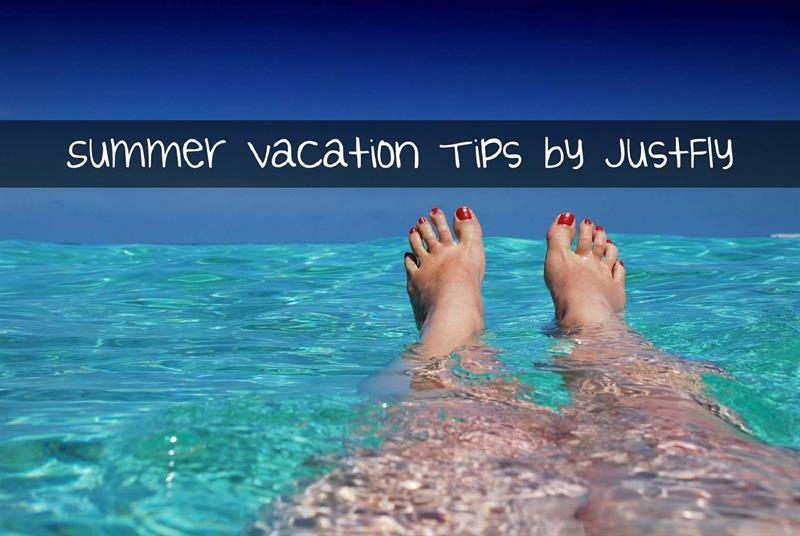 Today, JustFly gives you some useful summer vacation tips to keep you cool and amazing despite the summer heat! While this may seem like a cliché, I cannot stress how important it is to remain hydrated during the summer. Whether you're frolicking around on the beach or checking out rides in Disneyland, don't forget to keep a bottle of water or juice on hand. Keep in inside your purse or backpack and take a sip every several minutes. Don't wait for thirst to come, and always check your urine color (not very glam, i know, but it's necessary). If it's yellow, drink up! Summer isn't complete without visiting the beach or a water park at least once. To complete the experience, don't be shy to jump into the water! Nobody likes that person who goes to the beach only to avoid getting wet. Like, what's the point of going there, right? But before going on Michael Phelps mode, make sure your phone (or any other electronic gadget) is safely hidden inside your bag, away from the destructive H2O! Bring a large ziploc bag and keep your phone/tablet/wallet/passport etc. inside. This way, you won't get them wet. Beach resorts in the US can get pretty crowded during the summer, with all the people flocking the coastline. Finding a parking spot for your car can be difficult. When you do find one, open up Google Maps (make sure to turn on your phone's GPS first) then tap and hold on your current location to drop a marker pin. This way, when you're all wasted or tired after a day of swimming, you will be saving yourself the stress of locating your car among the hundred others parked there. Simply open Google Maps again to view the location of your parking spot. While Google is a great help when looking for the best tourist spots to visit, it's still better if you ask the locals. You will not only find hidden (and usually non-touristy) attractions, but you will also save a lot of money since locals will not really charge you for the "consultation". Plus, you might even make new friends! Wearing sunscreen when on the beach seems to be second nature to many, but did you know that you should wear sunscreen even if you're not planning to go under direct sunlight? A lot of people love to get sun-kissed tan skin but sun damage is a very serious issue and could eventually lead to skin cancer. Even if you're not planning to go sun bathing, you should still wear an SPF 30 sunscreen. If you're planning on doing any other outdoor activities (regardless of whether it's sunny or not), wear an SPF 50. When putting them on, make sure to apply a generous amount. No need to be stingy! Also, dermatologists recommend applying them 30 minutes before your activity and reapply it every two hours. Imagine you're in the middle of taking a wonderful photo of the sunset — or taking the greatest beach selfie ever — and your phone suddenly died. What do you do? Hint: you don't wallow in despair. You simply plug in using your power bank! While a 10,000mAh (mAh means Ampere-Hour a.k.a. the capacity of its battery) power bank can fully juice up your phone, a 20,000mAh is a better choice, especially if you're planning to spend a whole day outside or if you have multiple devices that need charging. If you're really feeling extra cautious, perhaps a 32,000mAh power bank is the great choice. Packing some meals or snacks with you everytime you go to the beach will save you a lot of cash. If you've ever bought a dry piece of sandwich for $5 from one of those sketchy beach-side "diners", then you'll understand that homemade packed food is a much viable option. When packing your meals for the beach, keep in mind that a beach picnic is a lot different from a regular picnic. How? There's sand. A whole lot of sand. So avoid bringing a bowl of chili or anything sticky. Cookies, whole wheat bacon sandwiches, fruits, and lettuce wraps are great and healthy meal options. Plus, sand is less likely to those kind of food. While many people spend their summer vacations being physically active by playing around outside, some would rather spend it inside their air conditioned rooms, doing basically nothing for two weeks. While it's nice to take things easy and relax (which is basically the point of summer vacations, anyway), days or weeks of lack of physical inactivity can take a toll on your health. You might gain weight and your heart won't get the exercise it needs. So get out there and move! Summer vacations only happen once a year, so try not to stress too much about what to do or where to go, and just have fun! An itinerary is a great thing to have but make sure that it's not jam packed that you no longer get to enjoy the little things. Take in the warm sunset, walk barefoot along the coastline, or just sit down and watch the ocean's waves. What are you waiting for? Go book a flight today, and you might just experience the best summer you ever had. A great site for flight booking is JustFly.com. Here are some of the JustFly reviews for your reference. Have a wonderful summer! Goa is also known as the best holiday destination. It offers a great holiday travel experience for summer as well as winter. These tips seem useful to rejuvenate during the summer vacation. Thanks for this informative blog. it will help me to plan my next summer holidays effectively.